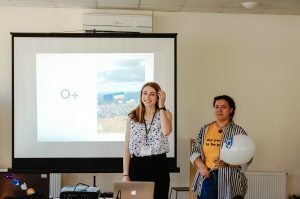 On June 16, FLEX City Representative Nina Kurochka ’17 (Quincy, CA/Poltava, Ukraine) held the first ever TED-like event in Poltava city: the Poltava Talks. 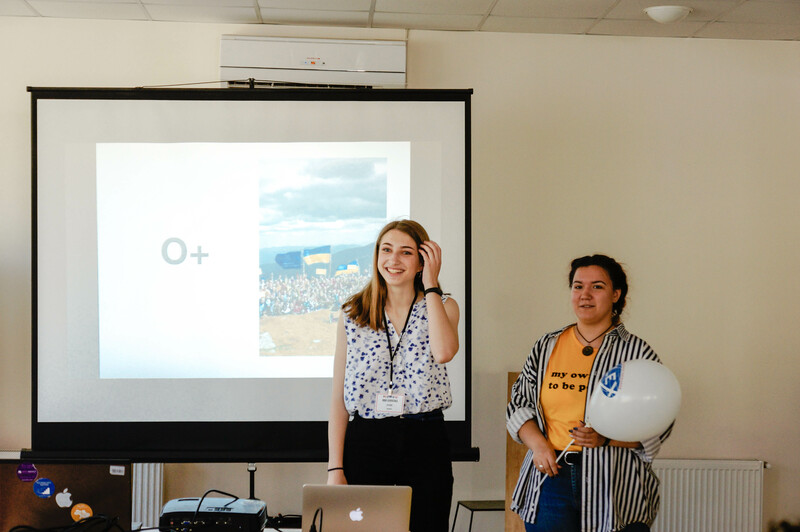 The Poltava Talks hosted 30 participants from ages 14 to 60 who came to hear five diverse speakers share their ideas about education, medicine, nutrition, environment, and communication. Nina shared that, “The idea behind the Poltava Talks was to bring events with innovative formats to Poltava, to boost the creativity and energy of the community, and to provide my friends and neighbors with valuable information. Poltava Talks was a bilingual event with two Ukrainian speakers and three English-speaking Peace Corps volunteer-speakers. Svyatoslav Kelym-Zolotayko, a mentor at the Ukrainian Leadership Academy, discussed the obstacles students face in the Ukrainian education system and what citizens can do to help improve education for everyone. Dmytro Marchenko, the head of the Poltava Medical volunteer organization “Barry”, shared how human nature stops us from helping others and how we can overcome this instinct in order to save lives. Reagan Duker, a Peace Corps volunteer, explained the varying levels of environmental pollution and how it influences our lives on a daily basis. Duker then offered suggestions for how participants could contribute to the reversal of this pollution. Kristen Dyck, another Peace Corps volunteer, talked about the ongoing changes in food culture in the world and explained the harmful effects of consuming sugar, meat, and fats. Lastly, Peace Corps Volunteer Linda Katz compared the difference in emotional communication between writing letters and texting with emoticons. Participants of the Poltava Talks left the event inspired to make changes in their own lives and in the world as a whole. Participants were very excited to attend the event and shared in the evaluation forms that the event hosted great speakers and provided extremely valuable information.